Mixed city is a term widely used in Israel to describe areas occupied by both Jewish and Arab communities. In a critical examination of such cities, the author shows how a clear spatial and mental division exists between Arabs and Jews in Israel, and how the occurrence of such communities is both exceptional and involuntary. Looking at Jewish-Arab relations in Israel in the context of the built environment, it is argued that there are complex links between socio-political relations and the production of contested urban space. The case study of one particular Jewish-Arab "mixed city", the city of Lod, is used as the platform for wider theoretical discussion and political analysis. This city has great significance in the present global context, as more and more cities are becoming polarized, ghettoized, and fragmented in surprisingly similar ways. This book examines the visible planning apparatuses and the "hidden" mechanisms of social, political, and cultural control involved in these processes. 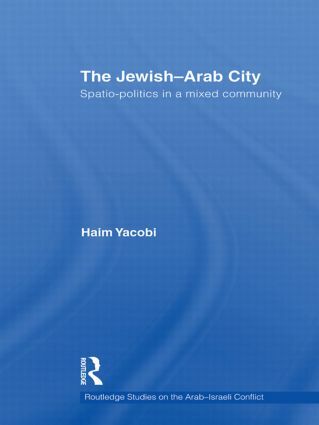 Focusing on the spatialities of power, this book brings to the fore a critical discussion of the urban processes that shape Jewish-Arab "mixed cities" in Israel, and will be of interest to students and scholars of Urban Studies, Middle East Studies and Politics in general.